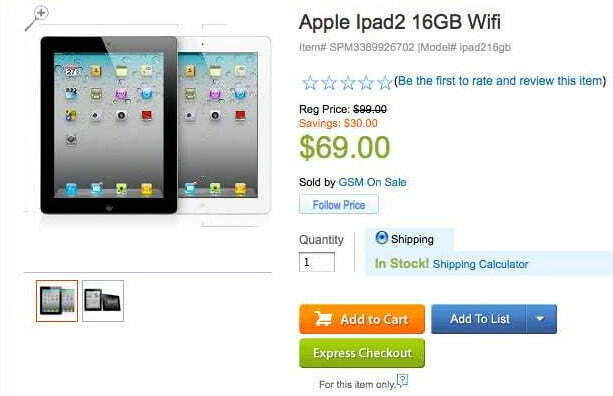 Sears is coping with some customer fallout after a typo on its site last week listed the 16GB iPad 2 as selling for $69 and the 32GB version for $169. In reality, they cost $499 and $599, respectively. And the happy shoppers who stocked up on the Apple tablets were in for a rude awakening from the retailer. While Sears itself wasn’t responsible for the posting (it came from GSM On Sale, an outside vendor), customers are crying foul, saying the company should honor the deals as they were listed. Some even contend that legally the store is required to honor purchases as they are listed, although Sears’ terms of service explicitly say that if pricing errors occur the retailer has the right to cancel any resulting orders. Some comments reflect concerns that Sears is being unfairly judged for GSM On Sale’s mistake. That would be easier to believe if it weren’t for other reports of pricing errors. BusinessInsider reports that a handful of customers recently jumped at the chance to purchase a Haier HL40XP1 40-inch 1080p LCD HDTV for a measly $87.98. However, they were soon notified the orders were canceled because the item was no longer in stock. But seeing as the unit is now listed on the site for $877.98, it looks as if another typo was to blame.